During the month of April, the Early Childhood Council of Windham County, in collaboration with the Early Childhood Educators' Network of Southeastern Vermont, will celebrate the Month of the Young Child. The ECC and the ECEN will kick of the month with a young children's art exhibit during Gallery Walk at the Robert H. Gibson River Garden. 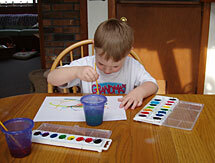 Art on display will be in a variety of media by the area's youngest budding artists. Area agencies and programs serving young children will offer activities, face painting, refreshments, and information at the River Garden from 5:30 to 8:30 p.m. The exhibit is made possible by the generous contributions of Zephyr Designs, Parent Express, Fireside True Value and Staples of Brattleboro. Other special child-friendly events will be listed in the calendar section of the April/May issue of Parent Express. This free newspaper is a local resource for parents and caregivers of young children and is available throughout Windham and Cheshire counties. The Month of the Young Child is an extension of the national Week of the Young Child celebration sponsored by the National Association for the Education of Young Children. It was established in 1971 in recognition that early childhood experiences (birth to age 8) lay the foundation for success in school and later life. The Early Childhood Council of Windham County is an open-membership community council that advocates for the full development of the area's young children. The Early Childhood Educators' Network is a group of center-based and family-based providers and early childhood educators with a mission is to support and encourage advocacy, networking and professionalism in the early childhood community. The ECC and the ECEN invite the greater Brattleboro community to join in the celebration of young children and to promote and recognize the high-quality programs and services that meet their needs.